our Mum and Dad. The memories of my childhood always bring a smile to my face, lots of sister fun. Our Mum was a wonderful seamstress. 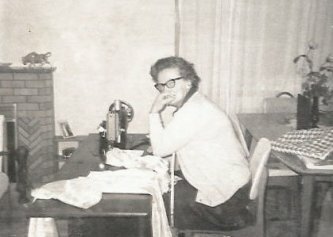 I spent many hours at her side learning her sewing secrets. 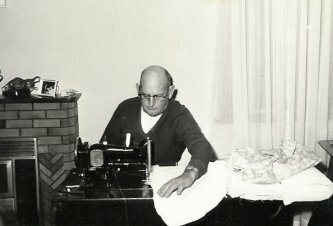 Dad was handy with a needle and not a stranger to a sewing machine. I don�t remember a time when I didn�t sew. I was always making doll clothes and eventually my own clothes. 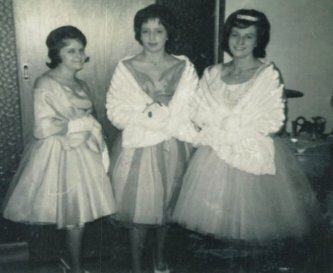 As a young bride, I came to America and pursued my love of textiles and fabric at every opportunity. When my two sons were little, they were the best- dressed boys in town! 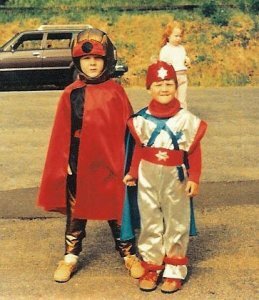 I loved creating all their outfits and Halloween costumes were my chance to shine. Over the years, while living in New York, California, Arizona and now Iowa, I have been an avid quilter and have taught quilting to support my �sewing habit�. 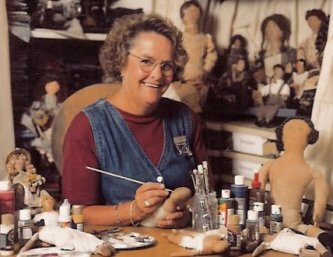 My early adventures in doll making led me to develop a deep appreciation for cloth dolls and related folk art. After going through some life changes it was time to get a �real� job. I am a part-time elementary school librarian and I teach knitting at a local knitting store. I began seriously pursuing my folk art several years ago. People really enjoyed it and wanted to buy it. I actively participate in Art Shows around the Midwest meeting wonderful folk who appreciate my creations. My two very special sons both live in Oregon and would like for me to move to that area. Hopefully this web site can make that a reality. 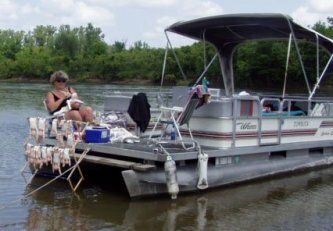 Being a �water person�, during the summertime, you will find me on my pontoon boat painting my creations. The river is the best studio, no phones and few interruptions - except an occasional storm. I have a wonderful network of friends who are always supportive of my endeavors. I share my abode with Max, the giant cat! All this leaves only a little time for another favorite past-time, ballroom dancing. Country Crafts magazine, and also in several editions of Australian Cloth Dolls, Bears and Collectibles.